AquaFX Magnesium Sulfate is the leading Magnesium within the aquarium industry designed to replenish Magnesium levels within a reef tank. Monitoring and maintaining appropriate Magnesium levels is an important part of ensuring water chemistry values are at an appropriate level. Resulting immediately in better coral growth, Coralline algae, as well as, invertebrate growth and health. 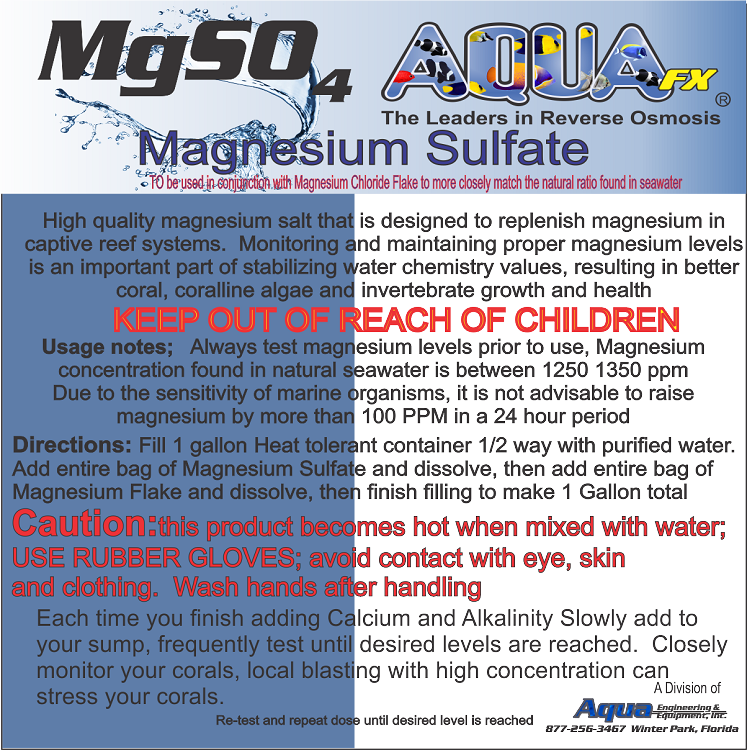 AquaFX Magnesium Sulfate can be used with AquaFX Magnesium Flake to more closely mimic the natural ratio in Seawater. Directions: Fill 1 gallon Heat tolerant container 1/2 way with purified water. Add entire bag of Magnesium Flake and dissolve. Then add the entire bag of Magnesium Sulfate and dissolve, then finish filling to make 1 Gallon total. AquaFX Magnesium Flake can be used with AquaFX Magnesium Sulfate to more closely mimic the natural ratio in Sea Water.